Modern design with modern features. 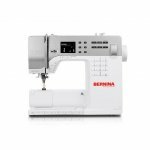 The 3 Series from BERNINA is high on both style and function. The B 330 offers a wide variety of stitches, from the practical to the decorative. Its ergonomic features are designed to make your sewing easier and its portable size allows you to take it with you wherever your sewing leads you. Ideal as a second machine to take to class or to the cabin.